Student loan debt is out of control in Florida and throughout the country. According to Forbes, there are more than $1.3 trillion in outstanding student loans in the United States. For a college student who graduated in 2016, their average loan debt is over $37,000. About 11 percent of student loan borrowers end up defaulting on their debt. This can be devastating for a person’s credit, and can make it difficult to find a home or even a job. Given this prospect, many people who fall behind in their student loan payments look for alternatives to help them restructure their debt. The FTC cited online advertisements by the SSS defendants touting “student loan forgiveness programs for qualified graduates.” The advertisements claimed borrowers could make “one low monthly payment” and “save 60 percent or more.” Telemarketers from SSS also called borrowers directly and told them they could enroll in in a “student loan forgiveness program” that was “preapproved” by the federal government. But after charging individuals “upfront fees” of as much as $1,200 and monthly payments of $49,99, the FTC said SSS “failed to obtain the promised lower monthly payments or student loan forgiveness.” In many cases, borrowers ended up falling even further behind on their student loans, since they were allegedly misled into thinking SSS was dealing directly with their loan servicer. And when borrowers tried to cancel their enrollment in the program, SSS allegedly told them they would “suffer adverse consequences” and lose their eligibility for other government debt-relief programs. In May, a federal judge granted the FTC a temporary restraining order halting the SSS defendants’ activities and transferring their assets to a court-appointed receiver. According to news reports, the receiver said as much as $30 million “could have been taken” from approximately 20,000 customers. The receiver will be responsible for liquidating any SSS assets and using the proceeds to compensate customers. When you are facing the prospect of default on your student loans, advertisements promising easy debt relief are understandably tempting. But more often than not, these promises are empty. There are, in fact, government programs that may be able to help. Depending on the kind of loans you have, it may be possible to postpone or restructure your payments, and in very limited circumstances obtain loan forgiveness. 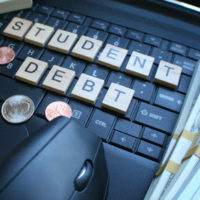 A qualified Miami student loan debt attorney can give you proper advice on what to do. Contact the Law Office of Julia Kefalinos today at 305-675-9545 to schedule a consultation with a Miami bankruptcy attorney who can offer you real options and not false promises.